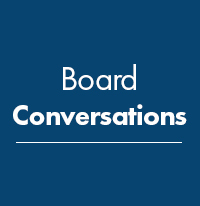 The Board Conversations series was initiated to foster sharing and learning on topics of great interest and impact to boards and directors. The sessions are held every two months or so, focusing on issues relevant to the board or each of the main board committees. BDC 1: Board risk committee. For each Board Conversation event, about a dozen chairmen/CEOs will be invited to discuss a specific topic in a roundtable setting over a meal (breakfast, lunch or dinner). The Board Conversations series is hosted by SID in collaboration with a partner organisation.